A customer alerted us to an issue with their acid-based anodic nickel stripper. The issue had been ongoing for at least a couple of months and they had tried many different things to solve the issue. One of the issues was the automatic backwash filtration system had been down for an extended period. It was thought that was the main culprit, based on the appearance of the strip solution showing a great deal of floating solids that would settle to the bottom when there was no circulation. The filtration system was fixed, and the customer decided to dump and make up a new strip bath. For the first few days, the strip seemed to be back to normal. However, after about three days, the bath started to appear murky again and the stripping performance was well below expectations. One benefit of an acid-based anodic stripper is the ability to strip the chrome and nickel but leave the substrate in its pre-plate polished condition. However, the customer was unable to strip many of their parts without negatively affecting the substrate. In fact, there was one part type (the customer’s largest volume) that would not strip at all. The Asterion technical team made constant visits to the customer’s plant, each time taking a comprehensive series of samples that were promptly shipped and analyzed at our advanced laboratory. However, beyond sample analysis to identify the problem, we relied on our most important resource: the customer. The customer’s line operator has almost twenty years of experience on this line and provided valuable insight. As a result of listening to the experienced operator, we learned the viscosity of the bath was lower than what the operator was accustomed to, and further research revealed the operating concentration for the components had been changed to lower values a few years back. 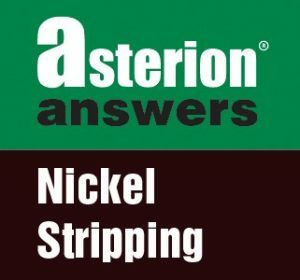 Using this information led Asterion to adjust the chemistry back to previous operating values, and as a result, the strip bath eventually returned to successfully stripping the nickel-chrome plated parts and leaving the substrate in a condition with which the customer was pleased.